Bright green lures are often effective for walleyes in deep water. Walleye are predatory game fish that eat a variety of aquatic organisms, including fish, insects, crayfish, snails and salamanders. When food is scarce, the opportunistic fish will expand their diet to include virtually any creature they can catch, including small mammals that enter the water. The young fry, who are too small to consume fish and bugs, primarily consume plankton and other microorganisms. Bass, pike and other large fish hunt young walleyes, but adult walleyes sit atop the food chain; their only important predators are humans. Walleyes may consume virtually any fish that lives alongside them, but drums and yellow perch are among their most important prey species. Although they have a strong sense of smell, acute hearing and an effective lateral line sense, walleyes have exceptional eyesight, which is their most important sensory pathway for locating prey. This incredible eyesight causes walleyes to avoid bright conditions. They often lurk in deep water during the day, before entering the shallows at night to hunt. Because of their broad diet, a wide variety of lures and presentations are effective for catching walleye. 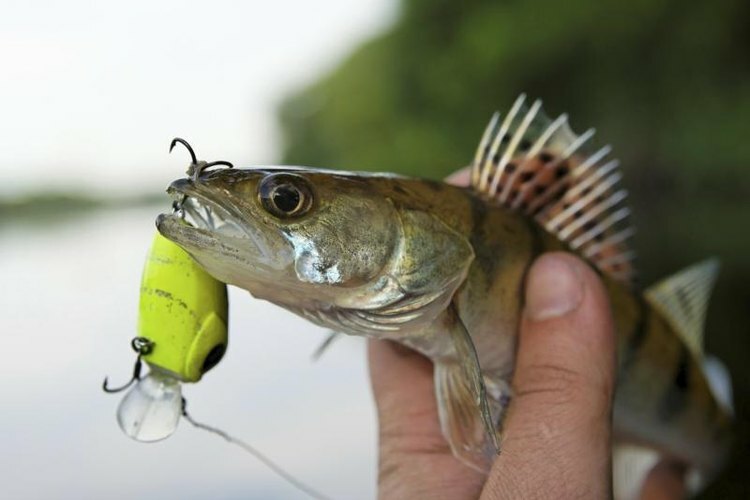 Minnow plugs up to 5 inches long work well for catching walleye in shallow water. Spoons and deep-diving crankbaits often trigger strikes from fish that are holding in deeper water. Additionally, live minnows, shad or earthworms are very productive baits for walleye. Walleye are nocturnal feeders, so they are easiest to catch after sunset; however, overcast days may trigger these fish to search for food.